Massive Twitter.com typo case terminated, then refiled. An arbitration case at World Intellectual Property forum over the domain name Twiter.com has been terminated, only for the company to file a second case. Cases are typically terminated when the domain owner agrees to hand the domain name over to the complainant. In this case it appears the case may have been terminated and then refiled after the domain name registrar disclosed the owner of the domain name. 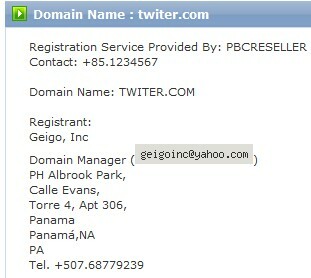 The Whois record for Twiter.com at the existing registrar (Power Brand Center) shows the owner as Panamanian company Geigo, Inc. The domain still resolves to a CPA survey page made to look like Twitter. The whois record is different from the one that’s been in place for a couple years, so this would appear to be a slam dunk UDRP for Twitter. It’s possible that Twitter refiled the case now that it has this (and other) new information that will make it easier to win the case.